"There can be no keener revelation of a society's soul than the way in which it treats its children," said the late President Nelson Mandela at the launch of the Nelson Mandela Children's Fund. Indeed children are every society's treasures and our best hope for the future. Celebrating this season of joy in giving, let us also take some time to remember the children that are less fortunate, and give them a ray of sunshine. This Christmas, Cheras LeisureMall unveils its theme for the season - ‘Christmas From The Heart' where the mall is transformed into a glimmering wonderland, and launches its annual charity programme-- "Toy Bank - A Gift of Love" from now until 27th December 2015, to bring smiles to underprivileged children's faces by fulfilling their wishes. Isn't it a meaningful thing to do this season? 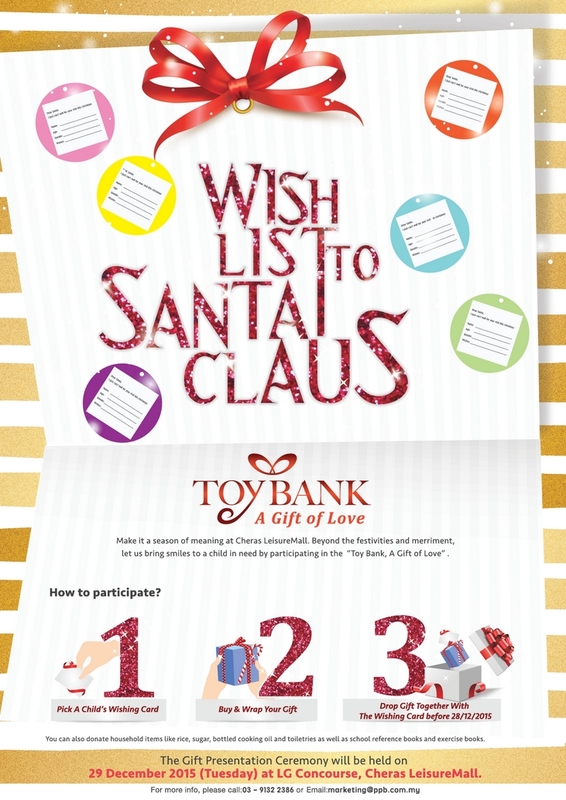 Just pick a card from the wishing tree, select a toy or gift from child's wish list and then deposit the gift together with the wish card at the Toy Bank located at Ground Floor Concourse. Alternatively, you can donate household items such as rice, cooking oil, toiletries, canned food, detergent and school books to the homes. The children from the respective orphanages and charity organizations will be at Cheras LeisureMall on 29 December 2015 to receive the gifts after a fun-filled day at the mall. The recipients for this year include children from Shepherd's Centre Foundation, Trinity Community Children's Home, Persatuan Kebajikan Warga Tua Dan Kanak-Kanak WP, Pusat Jagaan Beribuan Kasih, Kajang, Bodhi Homecare Cheras, San Pedro Orphanage Home, Rumah Sayangan, Rumah Kanak Kanak Angels, Persatuan Kebajikan Kanak-Kanak Cornerstone, Yayasan Sunbeams Home, Rainbow Home, Rumah Bakti Nur Syaheera and Pusat Majudiri Y for the Deaf. "This little light of mine, I'm gonna let it shine..." Just as the famous children's song goes, Cheras LeisureMall encourages everyone to share their little light this Christmas. Christmas can be so much more than a festive holiday. Together, let's make Christmas a heartwarming season that encompasses great love and joy. I am happy to see children happy when their wishes are granted. I hope more large corporations will follow suit to give back to the community. It's far for me to drop by but definitely I'll share to my friends who live around the area! I will bring my family over to this meaningful event. Its joy to see a small gesture made the unfortunate ones happy. I'll go there to choose a card and hope that my present will cheer the child up. Good cause for all. good deed to do and spread the words. Lets do it together and definitely we can achieve 400 gifts for the children. good effort from cheras leisure mall. I was there last year christmas for their toy bank presentation event.. the looks on the children's face when they received the presents were priceless.